The two became renowned for their social affairs and were respected for their wealth and prominence. Madame Lalaurie became known as the most influential French-Creole woman in the city. Her daughters were among the finest dressed girls in New Orleans. For those lucky enough to attend social functions at LaLaurie Mansion were amazed by what they found. The three-story mansion was graced with delicate iron work and lavish interiors. The house had been furnished for grand events and occasions. Guests dined from European china and danced and rested on Oriental fabrics which had been imported at great expense. The finery of the Lalaurie Mansion was attended to by dozens of slaves and Madame Lalaurie was brutally cruel to them. She kept her cook chained to the fireplace in the kitchen; many of the others were treated much worse. It was the neighbors on Royal Street who first began to suspect something was not quite right in the Lalaurie house. There were whispered conversations about how the Lalaurie slaves seemed to come and go quite often. Parlour maids would be replaced with no explanation or the stable boy was suddenly just disappearing never to be seen again. A neighbor was climbing her own stairs when she heard a scream and saw Madame Lalaurie chasing a little girl, the Madame's personal servant, with a whip. She pursued the girl onto the roof of the house, where the child jumped to her death. The neighbor later saw the small slave girl being buried in a shallow grave beneath the cypress trees in the yard. A law that prohibited the cruel treatment of slaves was in effect in New Orleans and the authorities who investigated the neighbor's claims. The authorities impounded several of the Lalaurie slaves and sold them at auction. The stories continued about the mistreatment of the Lalaurie slaves and uneasy whispering spread among her former friends. Party invitations were declined, dinner invitations were ignored and the family was soon avoided by other members of the Creole society. In April of 1834 a fire broke out in the Lalaurie kitchen, it was started by the cook, who could endure no more of the Madame's tortures. The fire was not large but the cook chained to the stove suffered severe burns. When the fire service arrived she told them about her mistreatment and of the torture to the other slaves by the Madame Lalaurie. The fire fighters made a grisly discovery a behind a secret, barred door in the attic. They found more than a dozen slaves here, chained to the wall in terrible conditions. There were both male and female slaves some were strapped to makeshift operating tables, some were confined in cages, and human body parts were scattered about. Decapitated heads and human organs had been placed in buckets and a collection of whips and paddles were found. According to the newspaper, the New Orleans Bee, some of the women had their stomachs sliced open and their insides wrapped about their waists. One woman had her mouth stuffed with animal excrement and then her lips were sewn shut. The men were in even more horrible states. Fingernails had been ripped off, eyes poked out, and private parts sliced away. One man hung in shackles with a stick protruding from a hole that had been drilled in the top of his head. It had been used to "stir" his brains. There were a few who still clung to life, a woman whose arms and legs had been hacked off, another who had been forced into a tiny cage with all of her limbs broken than set again at odd angles.The fire fighters fled the scene in disgust and doctors were summoned from a nearby hospital. Even though the Lalaurie's were caught red handed the police did not immediately arrest the pair because of their high society friends. Fury swept through New Orleans and a mob gathered outside the house, calling for vengeance and carrying hanging ropes. Suddenly, a carriage roared out of the gates and into the milling crowd. It soon disappeared out of sight. Madame Lalaurie and her family were never seen again, alive anyway. Some reports suggest that Madame Lalaurie and her husband murdered up to 100 slaves during their time at the house. It is not known for sure what happened to the couple. 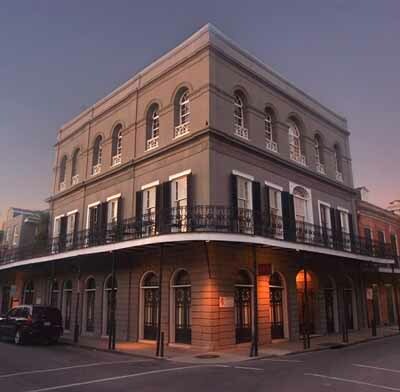 After the Lalaurie's had left the mansion numerous reports of screams of agony were heard emanating from the house at night, ghostly images of the slaves who died there were seen walking among the grounds and on the balconies of the house. The house passed through several owners' hands but know one stayed there long in was empty for nearly forty years. In 1890 mansion was converted into an etiquette school for girls. The school was open for 9 months then closed because of poor attendance. The girls that did attend the school said that they often saw the ghost of what is now thought to be Madame Lalaurie. The woman had black hair and pale skin her apparition was seen in the corridor after dark, sometimes she would be screaming. The girls that stayed at the school overnight said that they felt as though they were being pinned to the mattress or being strangled by an unseen entity. One visitor to the property saw the ghost of Madame Lalaurie throw a baby from the stairs but both her and the baby vanished before it touched the floor. The next owner only stayed a couple of months, he told neighbours that that he kept seeing the ghost of a black man covered in blood and chains at the end of the hall when he approached it would vanish. He was also seen in the bedroom at night walking through the walls. In the 1930's the building was converted into apartments, when they were renovating the downstairs kitchen the workman started to find human remains 16 skeletons were eventually removed, these were all victims of Madame Lalaurie and her husband. The mansion's next owner turned it into, appropriately, the "Haunted Saloon." Later, it became a furniture store, which did not last because the owner kept finding all of his furniture ruined inexplicably by a dark, stinking liquid. He thought it was vandals and stayed in the building one night with a shotgun, but when no vandals showed up and he examined his merchandise, it was once again ruined, the building was once again closed down. A physician then bought the property and restored it to its prior grandeur, a sitting area in the front and five apartments at the back.